St John’s is a church of friendly Christians in Elmswell, Suffolk, mid-way between Bury St Edmunds and Stowmarket. Our goal is to know Christ and make him known as we serve our community. Our services include a mix of contemporary worship songs and traditional hymns and reveal our reliance on the Bible as the Word of God and our trust in the Holy Spirit. We are strongly committed to introducing and building people up in the Christian faith through Bible teaching, prayer, worship, discipling and friendship. We are a broad range of people including families with young and grown-up children, pensioners, young professionals and many others. Whoever you are, of whatever age, you're very welcome to join us. 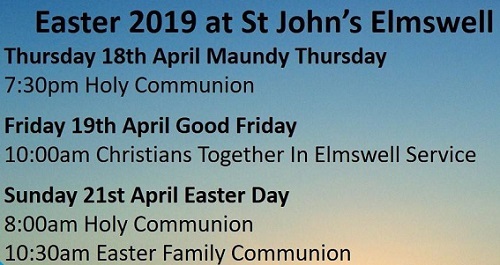 Whether you are interested in our history, wish to get married, have a child baptised, want to investigate Christianity or are looking for a place to worship and meet other Christians, we would love to see you. Why not have a look around our site to see who we are and what we do? He cut the grass with sickle keen. For Winter time, a stack of hay. In a manger, on the hay. There in the Kidron Valley, look! In Summer sun and morning dew. He cut the briar with blade so keen. Could now be plaited to a crown. The piercing crown of thorn to wear. And in God's time the tender shoot. He felled the tree with axe so keen. And from the planks a cross was made. Bearing my sin instead of me. The Son of God, on Calvary's tree. The Tree, the Cross that bows not down. To Jesus Christ, that we might live! We belong to the Diocese of St Edmundsbury and Ipswich, which is a part of the Church of England.